With a scientific name like Petaurus breviceps, meaning "rope dancer" a sugar glider is guaranteed to be interesting! They are small animals, about 12" from nose to tail tip, with huge personalities and a ton of attitude! They are inquisitive little clowns. Sugar gliders are nocturnal gliding marsupials. They are not rodents and are not related to rodents. They are closely related to koalas and kangaroos! Sugar gliders are a very primitive form of marsupial mammal whose basic body design has not changed in over 114 million years. Think about that a minute! These little creatures were around during the Cretaceous when the world was filled with dinosaurs. They came into existence about the same time as the flowers which produce nectar - on which they still feed to this day. And while they slept during the day, tucked away in their nests, the mighty T-Rex walked the land and pterosaurs flew through the sky. Petaurus breviceps means "tiny rope dancer"
A sugar glider's diet in the wild is varied and includes nectar and pollen from the blossoms of sweet gum, eucalyptus and acacia trees, and banksia bushes. They also lick the 'lerps' or sticky sweet exudates left on leaves by insects like aphids. And they injure the bark of the sweet gum trees with their very sharp bottom teeth to get to the oozing gum underneath. About 40% of their diet in the wild is sweet gum. In the wild sugar gliders are the main pollinators of the trees and bushes they visit nightly for pollen and nectar. Sugar gliders also eat insects, but in the wild they do this mainly during their one breeding season, and they will pass them up other times during the year even if the insects are plentiful. Most of their protein requirements when not breeding are provided by the pollen they consume. Sugar gliders are diprotodonts, a class of marsupial mammal that are now mostly extinct. Surviving species of diprotodonts are kangaroos, tree kangaroos, wombats, cuscus, koalas, Australian possums, and sugar gliders. All diprotodonts have opposable thumbs on all four feet. All diprotodonts have the first two toes fused together on the hind feet that they use as a specialized grooming tool. 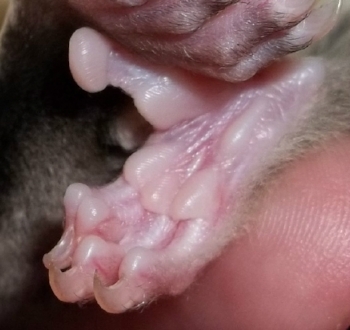 Sugar gliders also have opposable thumbs on all four feet. They have very sharp claws that act as Velcro and that they use mainly for gripping. Their large opposable big toes on the hind feet (hallux) do not have nails. A sugar glider's fur is a very fine and silky wool. All marsupials lack the longer, stiffer guard hairs common in other mammals, so their coat is very soft. The normal coat coloration of wild type sugar gliders is varied and can range from deep golden brown to steely gray and black. Sugar gliders are gliding marsupial and they have a very complex, muscled membrane of skin between their 'pinky fingers and their back feet that is flexible and stretches out to form gliding wings. The gliding membrane is called a patagium. A sugar glider's patagium is held close to the body while not in flight and when extended enables the sugar glider to glide up to 50 yards. In the wild this adaptation makes it easier for them to travel from tree to tree while foraging and helps them escape potential predators. Sugar gliders' tails make up around 1/2 of their overall length. Their tails are weakly prehensile, and they have been often observed in captivity carrying lightweight objects with their tails. They use their tails to help maintain their balance, and use it for balance and steering while gliding. A sugar glider's eyes are very specialized to gather in as much surrounding light as possible. Their pupils can dilate almost completely or shrink to mere pinpricks. Their eyes are not reflective, however, like a cat's, so they will not glow in the dark like a cat's do. Sugar gliders sleep most of the day and part of the night. Young joeys can spend as much as 17 hours or more per day sleeping! They enter into a torpor during the day and can be very hard to rouse. A sugar glider's life span in the wild is about 7 years. With good care and proper diet they can reach up to twice that age in captivity with proper care and good nutrition. Sugar gliders are social animals and in the wild live in single colonies with between 6 and 12 members. They are territorial colony animals and will aggressively defend their colony's sleeping locations and food sources from strangers, and even from unfamiliar sugar gliders. They identify members of their colony through smell. The dominant male rubs his head and chest scent gland all over every member of the colony and in this way they all obtain one single odor identification. The odor from the head and chest gland is mildly musky, sweet, and floral. Sugar gliders' normal scent is sweet and mildly floral and a little 'dusty.' But when they are frightened or startled they let you know with a burst of odor that is skunky, very acidic and quickly dissipates. Sugar gliders are pouched marsupial mammals that give birth to fetal infants that mature for several months in the mother's pouch. After they exit the mother's pouch they will continue to nurse for several more months before weaning. Sugar gliders are marsupial mammals that usually give birth to 1-2 very undeveloped joeys just 16-17 days after conception. The fetal joey weighs only 200 mg (0.2 grams) and is 5 mm in length (about the size of a cooked grain of rice). With its mother's help the joey makes its way into the pouch where it latches on to one of 4 teats, and where it will remain locked for the next 60-70 days before coming out of pouch for the first time. After the joeys leave the pouch they will continue to nurse for the next 60-70 days before becoming fully weaned. Adult female sugar gliders are poly- estrous and if not bred or carrying joeys in her pouch will go into a new estrous cycle every 29 days. But they are not prolific breeders in the wild, and the female decides when and if she will mate. In the wild they usually produce only one litter of joeys per year, with 1 or 2 joeys per litter. 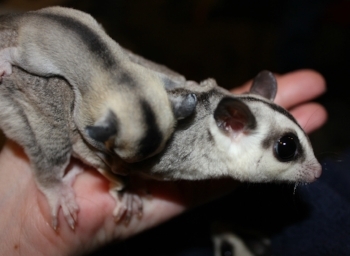 Domestic sugar gliders can produce 1-2 joeys up to three times a year. Adult male sugar gliders will breed with every mature female in their colony that will allow it. In the wild to prevent excessive inbreeding the dominant female ejects all the males from the colony every two years and takes in a new mate. In the domestic setting to prevent inbreeding, breeding colonies are limited to one male and one or two adult females (usually sisters) and sometimes a neutered male. Breeders remove joeys before maturity. All members of a breeding colony care for the joeys and take shifts keeping the Joeys warm and clean, and supervising them on their beginning night time excursions from the nest. 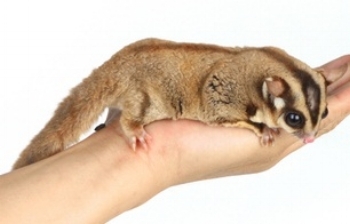 In the wild sugar gliders live in tropical eucalyptus forests. However, our gliders have been bred in the US for over two decades and are not acclimated to tropical temperatures. Sugar gliders have extreme difficulty regulating their body temperature and are susceptible to chill in environments below 65º F (18º Celsius), and they are susceptible to heat stroke above 87º F (30º Celsius). They should be housed only between 67º-85º F (19º-29º Celsius). Joeys younger than 7 or 8 weeks of age (after exiting the pouch) can't regulate their body temperature well and if they need to be separated from their parent before this age they will have to be kept warm. A sugar glider's life span in the wild is about 7 years. With good care and proper nutrition, they can reach up to twice that age or longer in captivity. One of the greatest hazards to a sugar glider is any form of standing water. Sugar glider can't swim and cold water will send them into shock. In cold water a sugar glider will almost instantly drown. 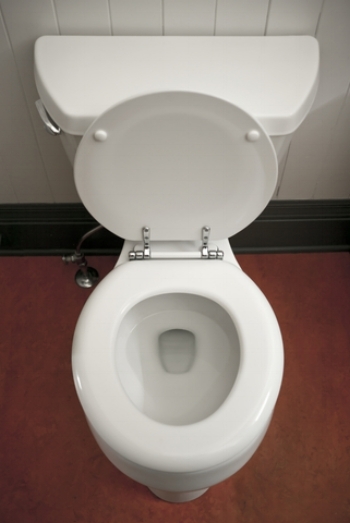 The leading cause of accidental death of pet sugar gliders every year is a toilet with the lid left up. But any standing water is a hazard for them.